In baseball, increased power means hitting harder and throwing faster - this is what we all strive for and train for. The Edge PowerTM is designed to elevate your training to the next level. It is the only adjustable weighted training glove on the market with proven results. A variable-weighted glove, it comes fitted with 12 ounces of weight per hand. The weight can be increased from 2 ounces up to a pound by 2 ounce increments. Additional weight packs can be ordered to reach the maximum weight of 1 pound per hand. The Edge PowerTM was first developed to strengthen a third baseman’s arm to increase the velocity of the throw, and it worked! Shortly after it was introduced it was tried as a training device to increase hand speed for batting. Again, it worked, and it continues to work over and over again. The Edge PowerTM helps strengthen every muscle used in the throwing motion. Every player from Little League to professional can benefit from The Edge. It is great for stretching, warming up and practicing. This is the only training device that strengthens while the wearer is doing nothing more than throwing. It's that easy! Not only does it increase velocity, it also helps to reduce chance of injury. HITTING: The Edge PowerTM definitely increases power in hitting. The Edge can be worn during warm-up, in the batting cage and during batting practice. It is no secret that bat speed is a vital part of power hitting and The Edge works to increase bat speed. By wearing The Edge on a regular basis, swinging the applied weight helps strengthen all the muscles used throughout the entire swinging motion. This is known as functional strengthening through functional exercise. This not only works for the major muscles, but also the minor muscles, which help with control. *The Edge Power glove is not recommended for players under 13 years old. The smallest size available is Adult small. *Inspect the weight pockets before each use to check for holes or tears. Discontinue use if you notice any type of hole or tear in any weight pocket. Contains lead weights, proper care and use required. DURA-TACKÔ Leather palm for a secure grip!! Organized baseball at all levels has begun to emphasize off season strengthening and conditioning in an effort to decrease the incidence of rotator cuff damage. Current programs generally employ gym and rehabilitation equipment. Exercises using weights and pulleys do not simulate functional throwing speeds of shoulder rotation which exceed 4,000 degrees per second. In 1992, we developed and tested a weighted, fingerless, Iycra glove for use during indoor throwing. It was tested for safety and effectiveness over the next two collegiate baseball seasons. A two-phase safety study and a two phase training study were conducted from 1992 -1994. All players volunteered and gave informed consent Coaches were contacted at the completion of the following baseball season to assess incidence of injury. Nine pitchers had retro reflective markers placed in 14 anatomic locations shown in Figure 1. All pitches were thrown from an indoor mound 63 feet away from the catcher. Two conditions were tested loaded (with the seven once Iycra glove) and unloaded. All pitchers threw five fastballs. Glove testing was in randomized testing order. Video data were collected using four NAC. cameras at an equivalent frame rate of 200 frames per second. The video data were converted to three-dimensional data points using Motion Analysis ExpertVision software. Data were then reduced to yield: 1) Stride length; 2) Stride direction; 3) Distance from stride foot to midline; 4) Lateral trunk lean (at release); 5) Ball velocity; 6) Release point relative to the front foot; 7) Elbow kinematics/kinetic time plots; 8) Shoulder kinematics/kinetic time plots. Five pitchers threw three. 20 pitch intervals with four minutes rest between intervals in the loaded and unloaded conditions Marker placement and video analysis were identical to the Safety Phase I Study. Eighteen collegiate pitchers were involved in an off-season program. Each pitcher threw a simulated game consisting of four, 20 pitch innings with four minutes rest between innings. Athletes were then assigned to either the glove (7 ounce Iycra glove) or control group by randomized block design with velocity as the blocking factor. They then completed an eight week throwing program. (Table 1) Post- testing was identical to pre-testing Video data were collected from the first pitch of the simulated game and the last pitch of each inning at both testing sessions. Velocity data were collected for each pitch using a calibrated Decatur radar gun. Pre and post-test motion analysis was performed similar to those used in the Safety Studies. Fifteen collegiate pitchers with a mean weight of 864kg were randomly assigned to a loaded or unloaded group as described above. Loading (glove weight) in this study was 0.035% body weight which was determined from a pilot study and represents mean mechanical breakdown minus two ounces. Phase II was conducted identically to Phase I with glove vs. control at 8:7. Phase II throwing program was similar in pitches to Phase I, but was extended to 10 weeks. Pre-testing post-testing were identical to Phase I. The three-dimensional coordinate data were smoothed with a second order Butterworth filter with a cut-off frequency of 11 hz. Elbow and shoulder joint centers were determined by translating the lateral humeral condyle and acromion process markers a fixed distance into the joint structure. The elbow joint center was determined by translating the lateral humeral condyle marker into the joint structure five centimeters along the nexion/extension axis of the elbow joint. The shoulder joint center was determined by translating the acromion process marker into the joint structure seven centimeters along the horizontal adduction/abduction axis of the shoulder joint. The elbow and shoulder joint angular positions were calculated using ZYX fixed axis rotations The joint angular velocities were then calculated by differentiation of the joint angular positions. Finally, the joint reaction forces and torques were calculated using standard inverse dynamics. Segment centers of mass and inertial values were obtained using the methods described by Zatsiorsky & Seluyanov (1983). Loaded and unloaded conditions were analyzed descriptively. The valgus stress on the elbow (Figure 2), that has been associated with injury showed no increase in valgus stress from MER to ball release, but demonstrated a 45% increase after ball release when compared to the normal throw, (Table 2). The loaded condition resulted in a slight increase in MER (2 degrees) and a larger ER at ball release (28 degrees). There was an increase of 22% in shoulder abduction torque (Figure 3) and 17% increase in horizontal adduction torque before ball release (Table 2). There was also a 20% increase in horizontal abduction torque and a 30% increase in shoulder adduction torque after ball release. Together these suggest that the deltoid and supraspinatus are loaded during the acceleration phase and the posterior deltoid, posterior cuff muscles and subscapularis are loaded during the deceleration phase, At ball release, there was no difference in compression force but a slightly greater inferior shoulder force (15%) (Figure 4), greater elbow flexion torque (Figure 5) and anterior shoulder force (Table 2) during acceleration suggesting that the glove loads the supraspinatus and biceps at that time. The results of this study indicate that an overload equal to seven ounces applied to the dorsal aspect of the hand will not create differences in kinematics or kinetics over a 60 pitch sequence when compared to the unloaded condition. 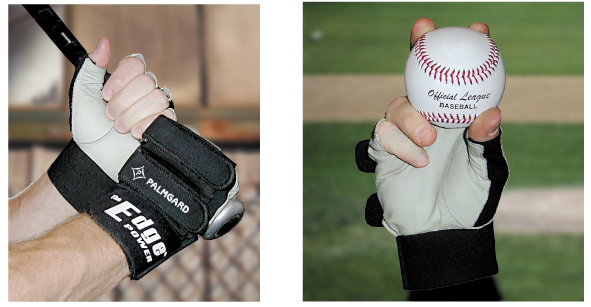 The absence of major mechanical differences during the use of an overload glove suggests it is safe to use in further training studies to investigate the effects of this type of overload on training of baseball pitchers. The results of this study indicate that training for eight or ten weeks (Table 1) using a weighted glove produced no notable changes in the pitcher's throwing mechanics. Furthermore, training with a weighted glove elicIted an increase in pItch velocity of 2.2 mph which was 3.6 Standard deviations above the pre-test mean velocity (Figure 6). This increase in velocity occurred in spite of the fact that none of the kinematic or kinetic parameters displayed obvious changes as a result of training with the glove. On average, 50 pitchers each year from major league baseball make their way to the disabled list and arguably the injury rate is even higher in amateur baseball. None of the pitchers who completed the training program with the overload glove suffered an injury to the throwing arm in the season following the study. Admittedly this is anecdotal, but it is striking nonetheless. Research involved with tracking the incidence of injury to pitchers using various training programs need to be performed to verify this relationship. The rotator cuff can be safely overloaded at functional speeds with the use of the weighted glove. The overload forces created on the elbow and shoulder may necessitate a healthy inner elbow and rotator cuff prior to training with the weighted glove. Glove training in the off season can improve velocity almost 3 mph greater than training without the glove. Despite inclement weather and limited space, a throwing athlete can train year round and expect fewer overuse injuries using the weighted glove. In order to achieve the greatest gains from the use of Edge Power Gloves it is best to adhere to a training regimen that is sport specific in nature. The following programs are suggested in an effort to assist you in achieving your goals. Keep in mind that a training regimen of at least 6 weeks is suggested before significant gains can be attained. Enhancing your skill in any given sport is a matter of applying Discipline, Desire and Dedication coupled with the proper training tool. You have ordered one of the finest training products on the market today. Now it is up to you to apply the Discipline, Desire and Dedication to achieve your goals. Good Luck and thank you for purchasing the Edge Power Gloves. Begin with a distance that you are comfortable with. ** It is recommended to limit the weight to a maximum of 10oz. for throwing exercises. Use good judgment and use only enough weight to throw comfortably. The above program is a training system that incorporates the Overload/Underload philosophy. This training regimen has been utilized in virtually all sports with proven results in modifying the muscle fibers in an athlete. The Overload function creates strength and endurance fibers, while the Underload function develops and enhances the fast twitch muscle fibers. The muscle memory created by a dedicated training program following this principle results in enhanced strength and speed in the sport specific muscle groups the athlete is training. In this instance greater arm strength and arm speed will result in a ball being thrown with greater velocity. At the conclusion of the two-week phase, assess your improvement and ability to increase repetitions without harm to your body. If you feel you can increase the workload, it is suggested that you perform the above program two times per session. Every body knows the importance of bat speed, but few people know how to attain it. By your purchase of the Edge Power Gloves product you realize that the right training product and a good training program can help you achieve greater bat speed. Mind you, the right product and training program won't do anything for you if you don't apply them. Ultimately, your success in attaining your goals is a result of your desire to achieve them. This product won't do you any good lying on your desk or sitting in your bat bag. Use them and follow the program below to see fantastic results in a few short weeks. This program can be utilized during tee work, soft toss, or dry cuts. Concentrate on performing a well-balanced, smooth swing. When performing dry cuts visualize a pitch in the perfect spot of the strike zone, take the knob of the bat directly at the pitch, try to delay the release of the barrel head into the impact zone for as long as possible. This prolonged delay is one of the secrets to bat speed. Keep your hand path short to the ball and long through the ball. You can also utilize the Edge Power Gloves in single-handed improvement. Incorporate the above 10,8,6,8,10,12,15 pattern while performing one hand hitting drills. You may also simply weight one hand of the gloves in the above sequence and follow a normal routine of soft toss or tee work. Top hand and/or Bottom hand improvement will result. If you feel you are weak in one of these areas, it wouldn't hurt to concentrate on that particular hand for a week or so. Normal cage work off of live pitching or a pitching machine is suggested. You may also perform pushups or some other form of strength conditioning exercise. A good exercise that is sport specific for bat speed is the Wrist Roll (performed with a light weight attached to a rope and rolled up on a piece of wood). Another is squeezing a tennis or racquetball. These exercises concentrate on the forearms and hands, very important factors in the hitting process. As you can see from the above training regimens the basic pattern is to decrease the repetitions of a given sport specific movement as the weight of the Edge Power Glove is increased. This holds true in the golf and tennis functions as well. The key of course is to consistently train in the program for long enough to train the muscles involved in the movement. It is suggested that the athlete hit golf or tennis balls without the use of the Edge Power Gloves at least two days a week. Follow the below program and watch your drives go farther and serves go faster in a matter of weeks. Golfers may wish to follow the routine with weights added and deleted from both gloves, or utilize only one glove for improvement with the lead or follow hand. Tennis players may wish to utilize both gloves while working on any two handed impact drills, such as a two handed backhand. Make an effort to perform the listed sequence of 10,8,6,8,10,12,15 to fully incorporate the Overload/Underload training system. Always use the "Soreness Rule" while training the arm and shoulder. If you feel soreness at the next training session, go through the training program without any weights, and only continue using weights when the soreness is gone. When training with weights, be patient. Begin with a comfortable weight and slowly increase the weight used. Use proper supervision while training with any type of weights. *Inspect the weight pockets before each use to check for holes or tears. Discontinue use if you notice any type of hole or tear in any weight pocket.